Beware of Monkeys; they are expert at plucking peaches. Grandmaster Wong further enhances their ability by showing them how to trap a kick and make plucking peaches a certainty! They are effective irrespective of their own size or their opponents' size. Indeed a small Monkey can skillfully control a much larger opponent. As kicks are generally more powerful and have longer reach than hand techniques, some martial artists mistakenly think that they are superior. 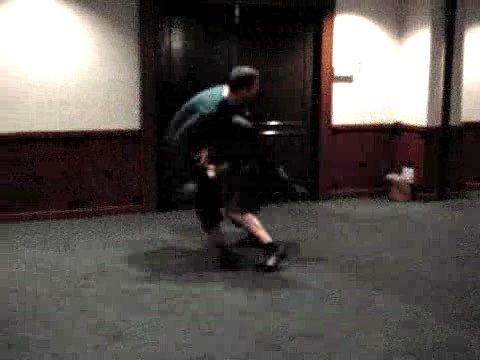 It is therefore illuminating to see Nick using hand techniques from his Monkey Style to handle kicks from Sifu Charles, who is much bigger and stronger. Nick uses minimum force to brush off Sifu Charles' kicks and counters with a strike and felling technique. 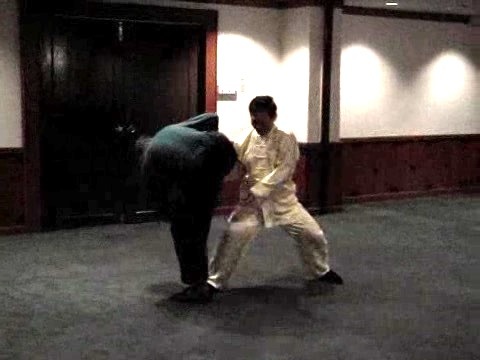 It is interesting to note that while some people mistakenly think that bigger size is an advantage, Grandmaster Wong, demonstrating the form and spirit of the Monkey, asks Nick to lower his stance to be smaller in size resembling a monkey. .What advantages do you think the small size Monkey has over his bigger opponent. Despite his smaller size, Grandmaster Wong easily fells and has Sifu Charles under control. Nick learns very fast. He avoids Sifu Charles' round-house and reverse round-house, plucks some peaches and fells a bigger-sized Sifu Charles onto the ground. He has his Monkey claws at Sifu Charles' throat to control him. The size of the video clip is 0.59 mb. Grandmaster Wong shows some finer points of the Monkey Style so that plucking peaches is a certainty. As Sifu Charles kicks, Grandmaster Wong hooks his kicking leg with a Monkey paw so that Sifu Charles could not escape as Grandmaster Wong plucks the peaches. This Monkey pattern is called “Plucking Fruit Beneath Leaves”. It is interesting to see how a smaller-size Monkey can control a bigger-sized opponent. Nick's response also shows an important tactic against an opponent who kicks. Do you know what tactic it is? It involves footwork and position. Notice also that Nick hooks Sifu Charles foot with his own foot to affect an effective felling technique. The size of the video clip is 0.44 mb. Not only a small Monkey but a huge gorilla is also adept at plucking fruit. Sifu Roland's fruit plucking technique is so sophisticated and effective that it is very difficult for the opponent to escape. This pattern is also called “Plucking Fruit Beneath Leaves”. The size of the video clip is 0.37 mb. Sifu Roland and Sifu Charles demonstrate the kicking attack and the fruit plucking response again. Not only Sifu Roland has his opponent's peaches plucked but also has him under control in an awkward position. Monkeys, big and small, are full of fun. Beware of Monkeys -- they are Expert at Plucking Peaches from Wong Kiew Kit on Vimeo.